Bryan Alexander has moved his forward facing blog/site bryanlaexander.org to Reclaim Hosting, so in other words there goes the neighborhood. Not long before severed feet start washing up on our virtual shores. There is no shortage of love on the bava for Bryan Alexander, and I do think the final coup will be getting Infocult off Typepad sometime soon—everyone has to have a dream. 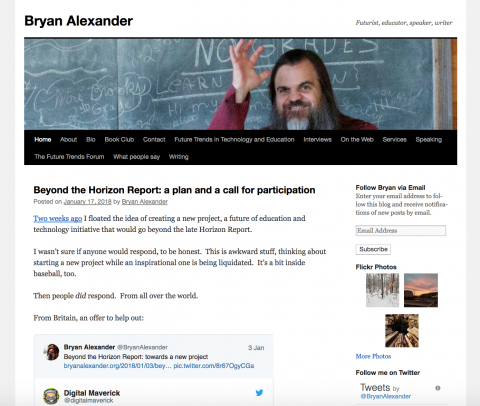 Two of the biggest blogging influences on the bava were D’Arcy Norman’s compulsive sharing of any and all edtech work he was working on (I just stole what he was doing with Drupal and did it for WordPress) and the bizarre, insane “Uncanny Informatics” that was Bryan’s Infocult. That were many other influences, but those two brilliantly framed the poles I wanted to oscillate between on this blog. So moving Bryan’s site from WordPress.com to Reclaim was cool for many reasons, and reinforces the essence of my last post quite well. Anyway, I’m blogging like an old timer here—but it’s my blog dammit! Anyway, the point of the post was to make a couple of quick observations about migrating Bryan’s site from wordpress.com to a stand alone WordPress instance. I think its interesting because when you’re migrating a site that’s your client’s bread and butter you don’t want to mess things up. Granted that moving between WordPress.com and a stand alone site is dead simple*, but things like images, embeds, and polls can get lost in the migration. Not to mention making sure they retain their wp.com followers/subscribers, widgets, theme, etc. [The theme was easy cause like the great bava, he is rocking Twenty Ten #4life.] And this is when I began realizing the genius of Jetpack. Jetpack not only enabled me to reproduce all the custom wp.com widgets like his Flickr photos, latest Tweets, email subscriptions, etc, but it also gave me seamless integration with Akismet and PollDaddy, which meant literally nothing was lost in the move. What’s more, when you have a significant number of email subscribers and RSS readers like Bryan, the fact that none of them are lost demonstrates how Automattic uses Jetpack as an umbilical cord between their various commercial services and the free, open source product that made it all possible. And then there are stats, added security, monitoring, backups, image hosting, etc. So, a day after the migration Bryan has access to a ton of different plugins and themes (not to mention the core code), but has lost none of the features wordpress.com provided—which is pretty brilliant. We’ll see if anything pops up in the immediate future, but outside the DNS caching pushing some folks to the old site, it’s been quite seamless. And if people do happen to comment on the old site while DNS is propagating (or Bryan shoots off another post too soon) nothing is lost given it is on the original infouclt.wordpress.com site. This might seem rudimentary to some folks, and I have done more than a few wordpress.com transfers now, but it struck me that if your whole livelihood revolves around your site, making a move like this seem trivial is amazing—so kudos to the good folks at Automattic for making it easy and to Bryan for becoming a reclaimer! This entry was posted in reclaim, WordPress and tagged migration, reclaim, WordPress, wordpress.com. Bookmark the permalink. What’s a drupal? I’m thinking of maybe moving back to Reclaim, with your shiny new Canadian colo server. Might be time to rejoin the Stable Geniuses. Hey. That’s a good band name. My lord Reclaimer, that was one slick migration. The new machine hums very well indeed. So many comments… you have inspired a new post from me, a nearly weepy one about the glory of so many fine people without which one cannot proceed.